Collector Babu A has asked various departments involved in the Krishna Pushkaram works to expedite their works so that there are no last minute hassles. 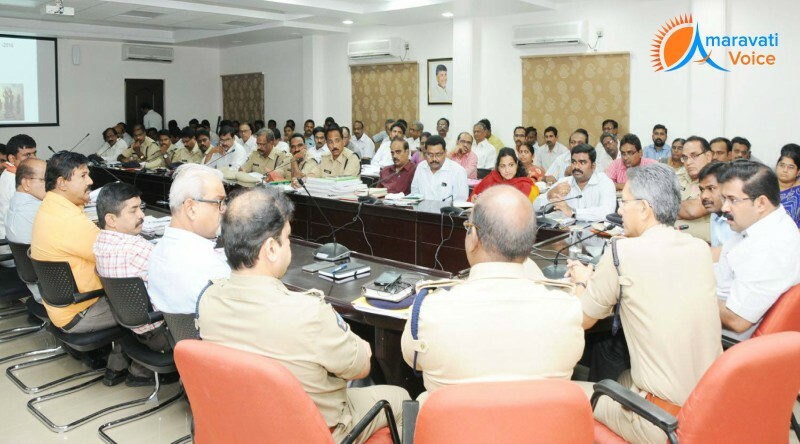 A coordination meeting of the officials of various departments involved in Krishna Pushkarams was held on Saturday. Railway department is making arrangements for the temporary railway stations for pilgrims during Krishna Pushkarams. Those coming from Vizag, Rajahmundry and Eluru would alight at Gunadala. Those coming from Hyderabad will alight at Rayanapadu. Those coming from Machilipatnam and Gudivada, Ramavarappadu and Madhuranagar will be the alighting points. Also arrangements are being made for easier transportation of the pilgrims to various ghats, including Durga Ghat, Krishnaveni Ghat, Pavitra Sangam Ghat, Guntupalli Ghat and Surayapalem Ghat. Roads and Buildings superintendent engineer K Seshu Kumar said plans to provide road connectivity to all ghats have been submitted. He said widening of main roads from Vedadri to Sagara Sangamam at Hamsaladeevi, expansion of roads from Jakkampudi to Gannavaram, widening of Polavaram Canal Road, Nuzvid Nunna road, Gollapudito sitara Centre, approach roads connecting Highways to Ghats are being planned. Irrigation department officials were asked to complete the necessary formalities in getting the permission for construction of new ghats. Plans to develop the river front from Prakasam Barrage to Punnami Ghat and at Ferry Ghat have already been submitted by the Chinese conglomerate GIIC. He directed the officials to work in coordination with the Chinese team. Other proposals include: The four-laning of the road between Ibrahimpatnam Circle and confluence of Krishna and Godavari rivers near the Ferry and construction of a pylon at Ibrahimpatnam Circle to reflect the Telugu culture and traditions. RTC officials were asked to arrange for mini buses to Pushkar Nagars from various locations. He suggested that the NTR Health University grounds, Zakir Hussain College Ground, Ibrahimpatnam Truck Terminal, VTPS College, Siddhartha engineering college grounds and Private lands in Tadepalli to be used as temporary bus stands for the pilgrims coming from the respective directions. Transco officials were asked to ensure all the transformers at the ghatsand Pushkar Nagara re well covered and fenced. He wanted three electrical sub stations, including 132 KV sub-station at Seethamma Wari Padalu to be completed at the earliest. Panchayat Raj department officials were asked to arrange for LED bulbs at the ghats under their purview along with the provision of other infrastructure facilities. The Collector asked the tourism officials to complete the tourism development works at Hamsaladeevi, Sangara Sangamam and Kondapalli Fort. Officials were asked to take the help of TTD and ISKCON for free distribution of food to the pilgrims. Similarly, cultural programmes would be organized at Tummalapalli Kalakshetram, Ghantasala Venkateswara Rao College of Music and Dance and the IGMC. City police commissioner Gautam Sawang directed the police officials to conduct a field survey to identify issues relating to traffic regulation and crowd management. The next coordination meeting would be held on April 4.